After receiving a degree in business computer science (Diplom-Wirtschaftsinformatiker DHBW), Michael Schwan worked for over six years as a consultant in the field of Management Information Systems and was involved in the implementation of planning applications. 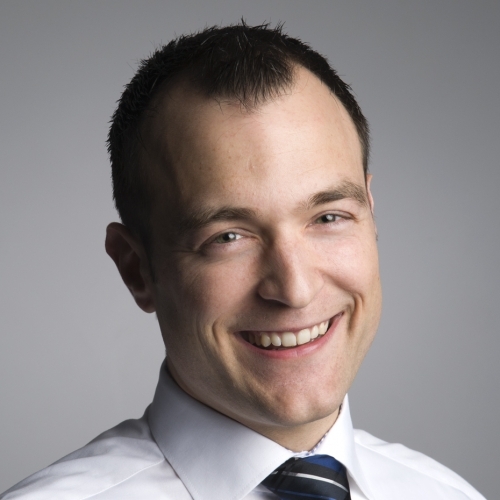 Today, Michael serves as Managing Director at HighCoordination GmbH, a service provider for IT-consulting focusing on QlikView technology and developing the IBCS® Certified Software product trueChart. Michael is of the opinion that the SUCCESS formula of the IBCS® Standards can be consistently applied cost-efficiently in all organizational and functional departments. The same is true for the classic cockpit segment, the corresponding drilldown scenarios, as well as for operative line item reporting. 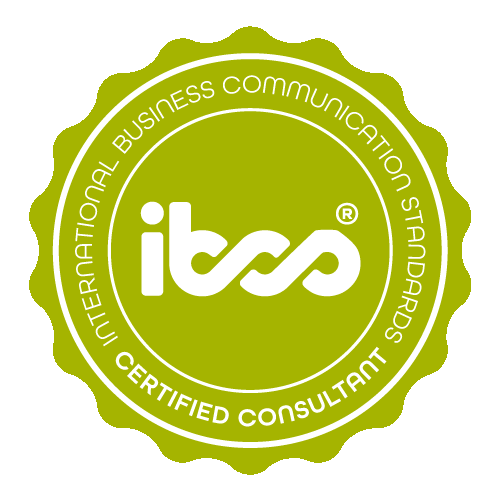 Michael Schwan has successfully completed the IBCS® certification for successful design of reports and presentations at the HICHERT+FAISST IBCS Institute in May 2011. 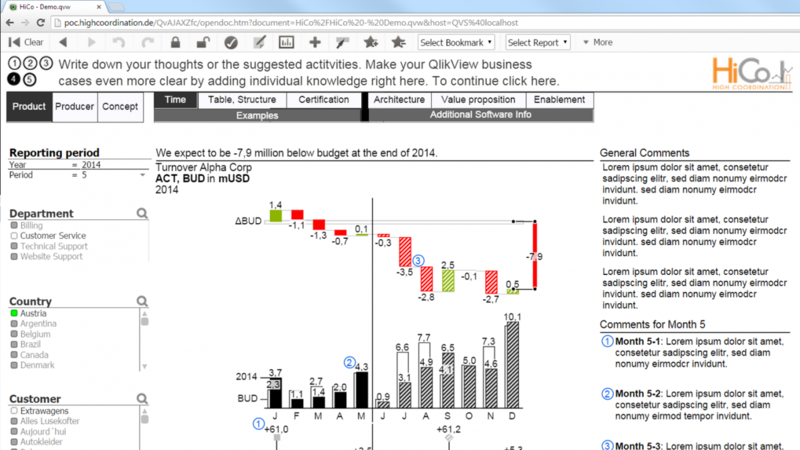 All samples are implemented by using trueChart, the IBCS® certified QlikView extension by HighCoordination. Time line with comments General and periodical comments complement the correctly scaled turnover progression to provide a meaningful and functional business case. Comments can be defined and linked to the dataset in any desired combination of user, language and data criterias. Time line, multiples The multiple turnover can be sorted strictly or optimized for space usage. Space usage is optimized by the available cell structure and totals or other cases can be identified and handled separately. 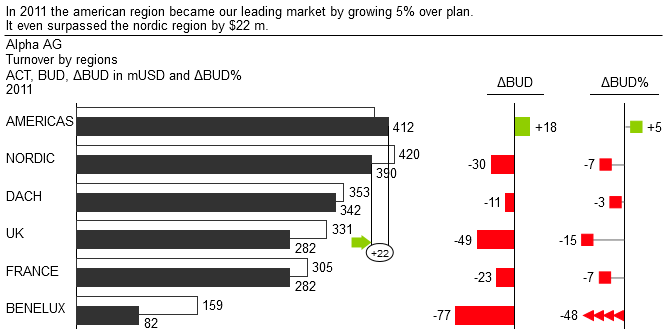 Structural waterfall of Helsana Group The waterfall illustrates the value ratios of the results for the fiscal year 2011 of Helsana Group, without deviating from the context of a strict earnings statement. The aim is to convey a correct feeling for the results and thus for the business of Helsana without omitting important items. 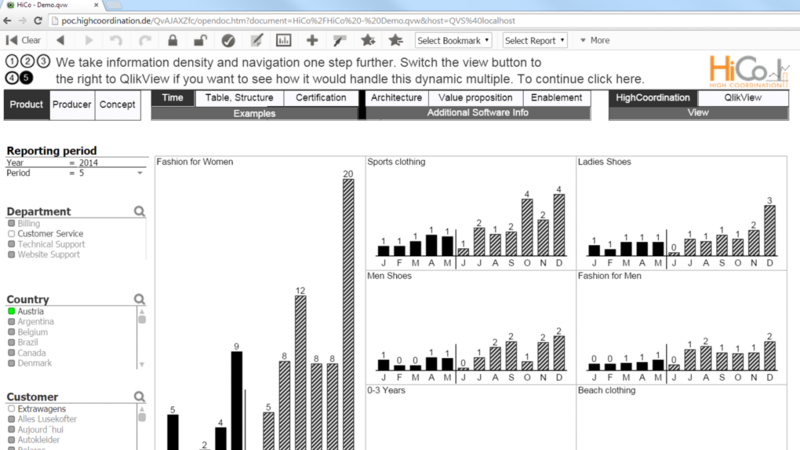 Structure with deviation values This example is borrowed from the application scenario of a navigable web interface. In dynamic interfaces, a special role is played by the correct, context-dependent positioning of all elements such as the dynamic, space-dependent labeling, the positioning of highlighting elements, as well as the observance of uniform surface measures.